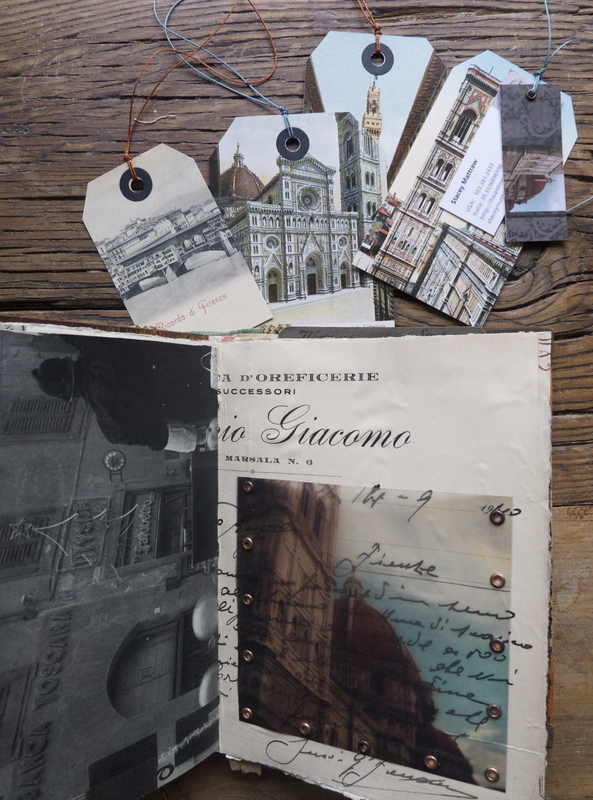 My fascination with the Duomo in Florence began in August, 1976. 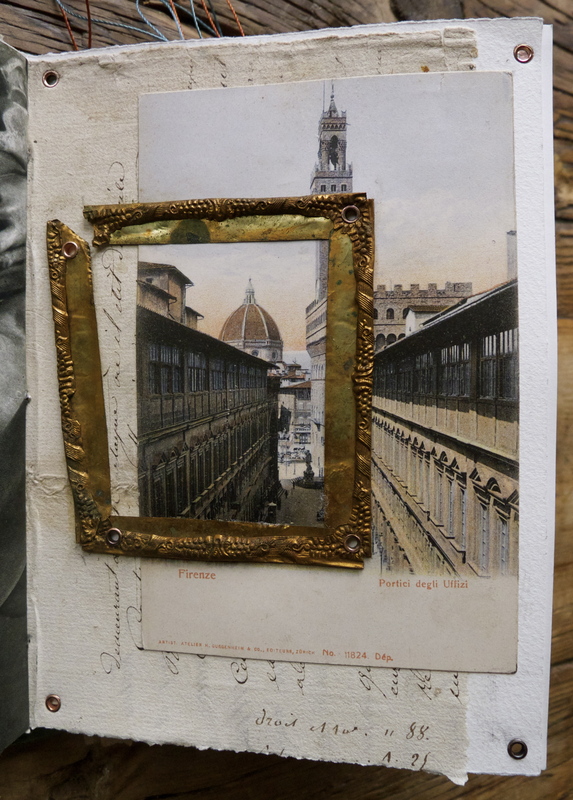 I arrived in Florence with 50 + other kids from California State University, to embark on a year long study abroad program that would be a pivotal point in my life, and set me on a trajectory that was completely unplanned and resulted in my love affair with Italy. Now, all these years later, Italy still has it’s sweet hold on me, and I am blessed to have the opportunity to live and work there several times a year. Stunned with disbelief, I was unable to move or speak for several moments. Time stood still. I had never seen ANYTHING this magnificent, but it was more than that. I was transported into some other worldly place. 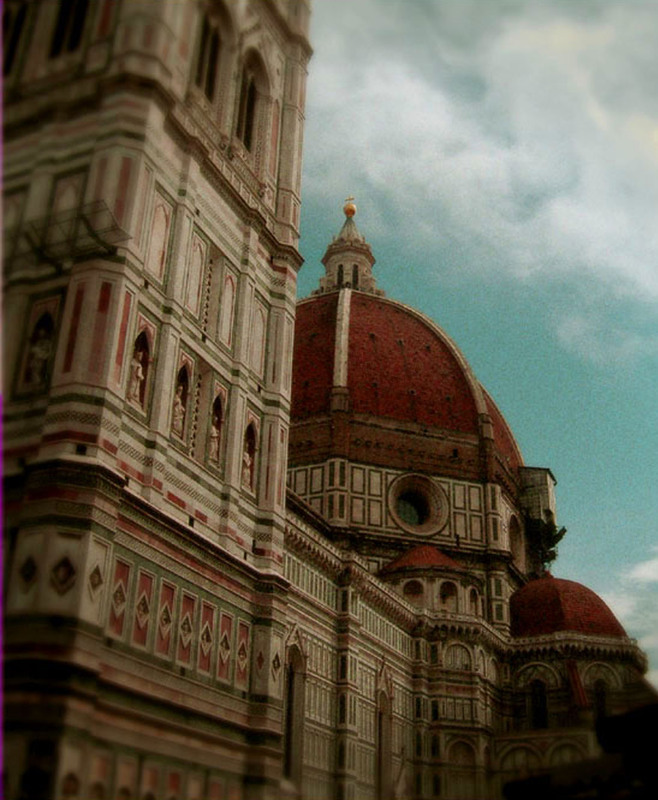 Florence and the Duomo were instantly signed, sealed and delivered permanently into my heart and innermost psyche. I was smitten. I was in love. I was hopelessly and happily hooked. I knew that this place would forever be a part of me. I did not have a vocabulary or even consciousness for the experience then, but what I do believe now, is that I was having my own personal epiphany or spiritual awakening. No doubt about it. The feelings and electricity that coursed through me then were too extraordinary to be anything but. I still have those sensations today in Florence, when I come around any corner and there it is again, Il Duomo, timeless and unchanging, no matter what is going on around it. The reconnection to this place never fails to thrill and send me into a state of ecstatic bliss and grace. Years later, when my boys were old enough to take instructions, I told them that when I die, I want my ashes to be scattered off the top of the Duomo. Period. No discussion. Climb the 463 steps. 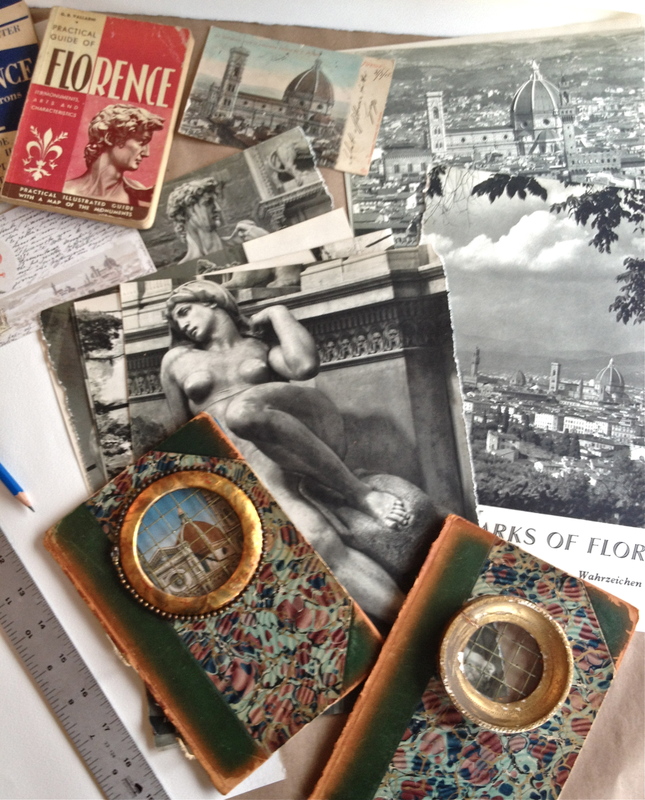 As an artist and an obsessively passionate flea/antique market shopper and collector of all things old, distressed and discarded, I have collected antique images, postcards, guidebooks and ephemera of the Duomo and of Firenze for years. I have boxes of the stuff. And I always buy more when I find it. I always will. I can’t stop. I don’t want to. 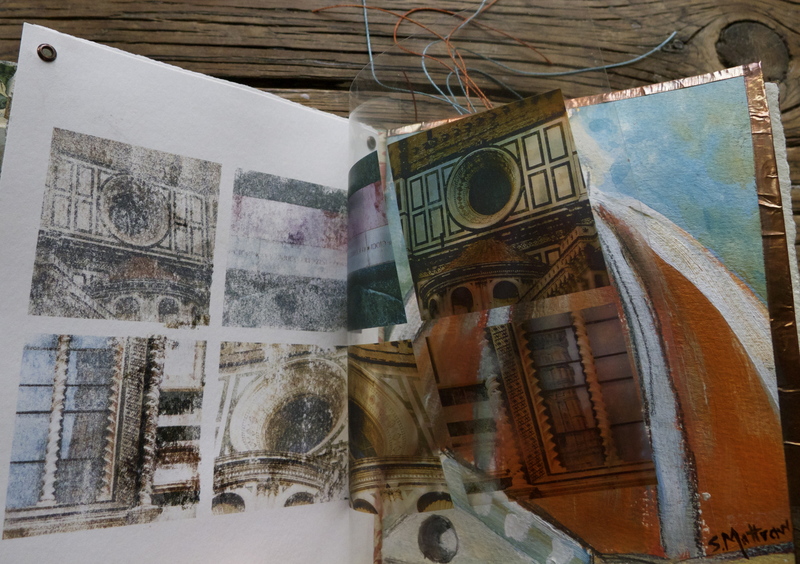 When it was time to participate in the 2013 Art House Sketchbook Project, it was non troppo difficile or difficult to figure out what I would do. 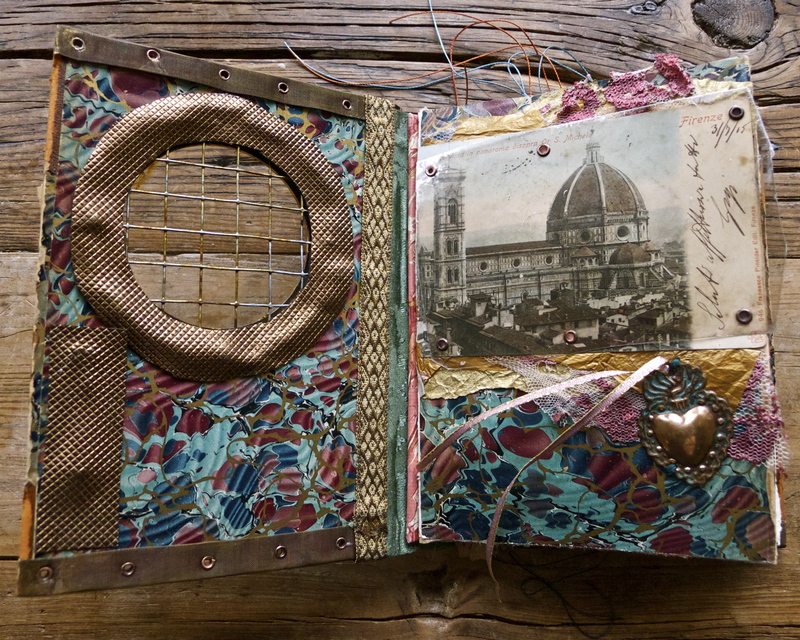 I would make an artists book utilizing and exploring images of the Firenze Duomo. 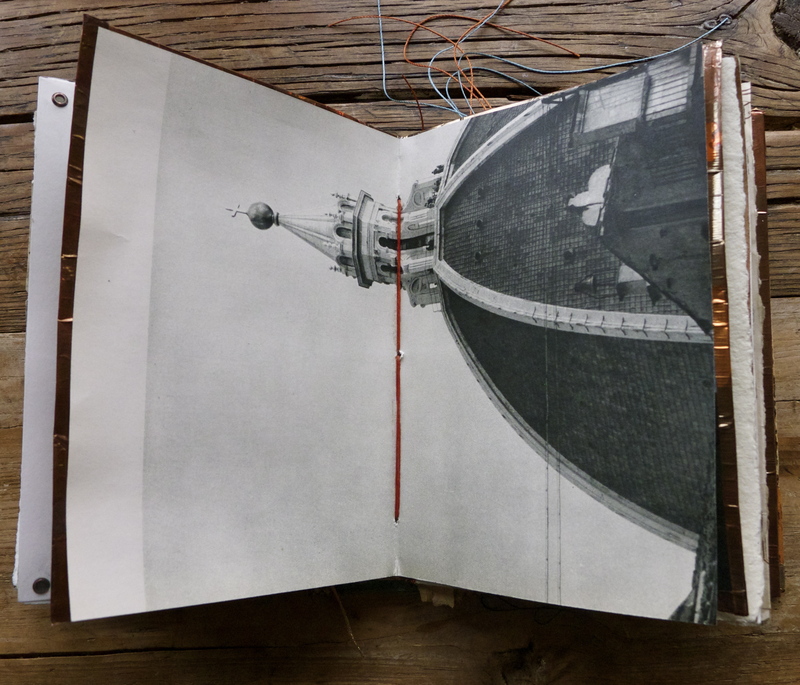 The parameters of the project were loose: a 5 x 7 book, no more that 1 inch thick. 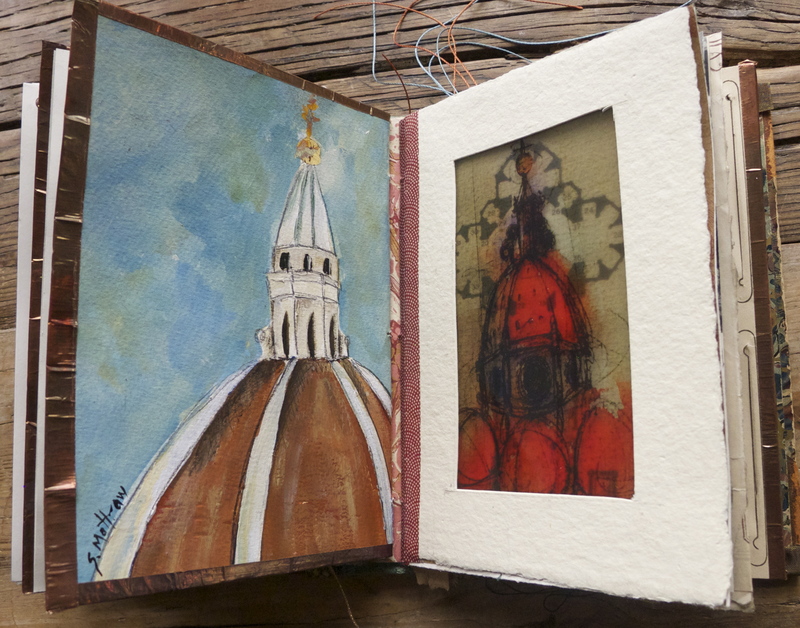 You could use the Art House Sketchbook that they provided, OR anything else, provided the size requirements were met. 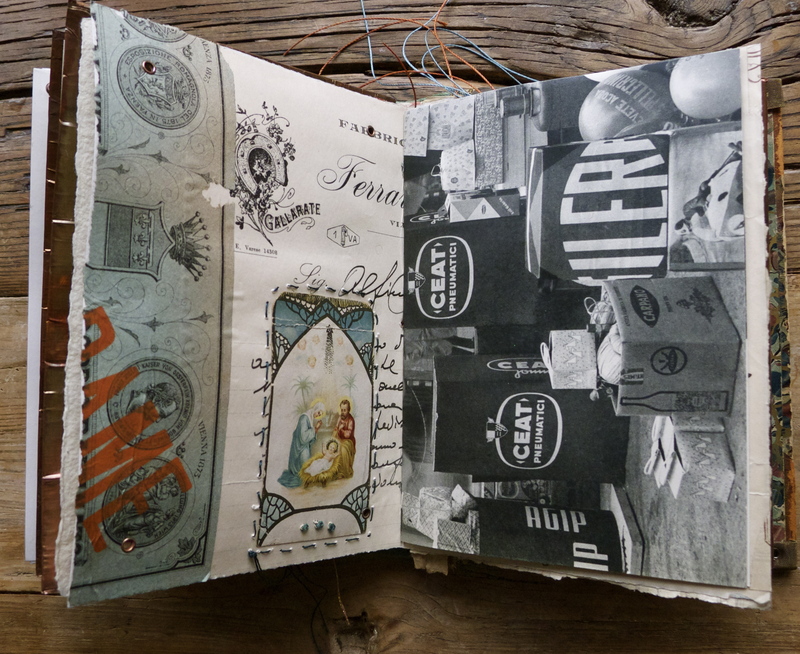 For the 2012 project that I participated in, I worked with the Art House Sketchbook as my book form but completely altered and covered it. 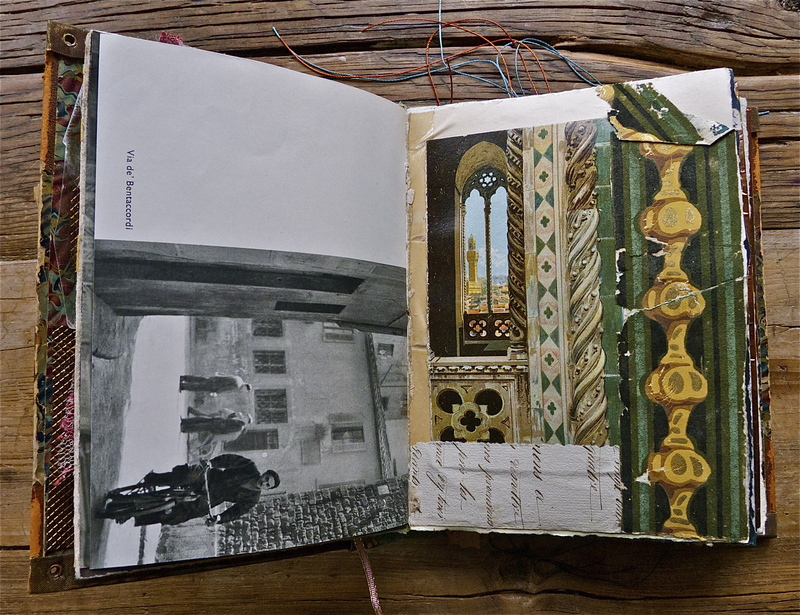 You can view my 2012 Sketchbook here. 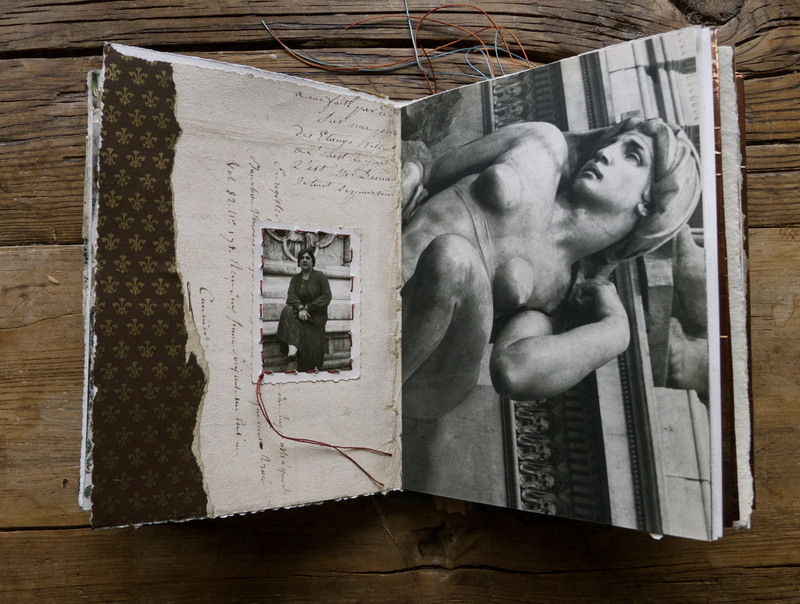 This year, I wanted to make my own book, within the size restrictions. 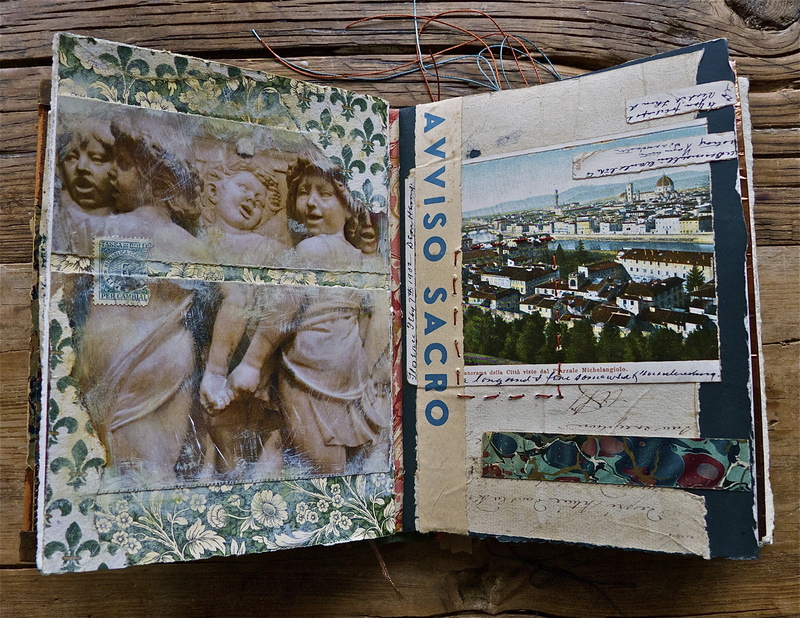 I wanted to use the covers of an old book , deconstruct it and put it back and then reconstruct. 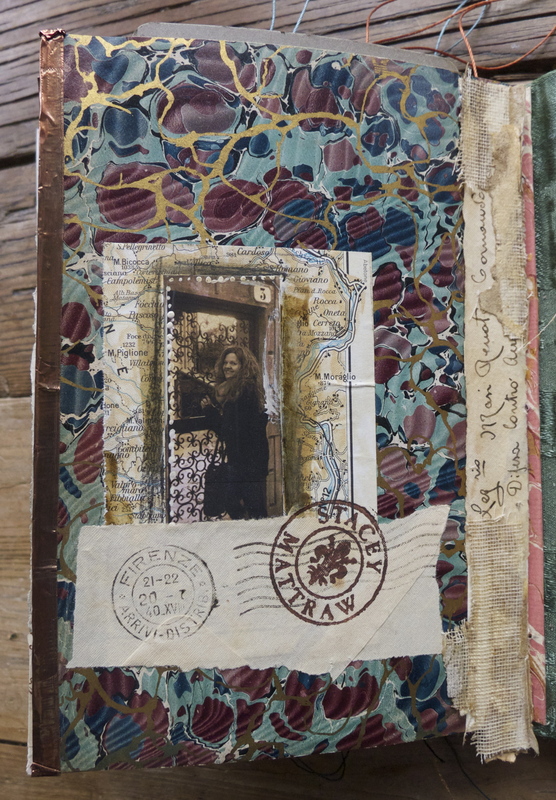 I collect old books, I have LOTS of them, and nothing I had felt quite right. So I searched Ebay and the perfect book(s) appeared. A pair of antique green and pink marbled paper books. 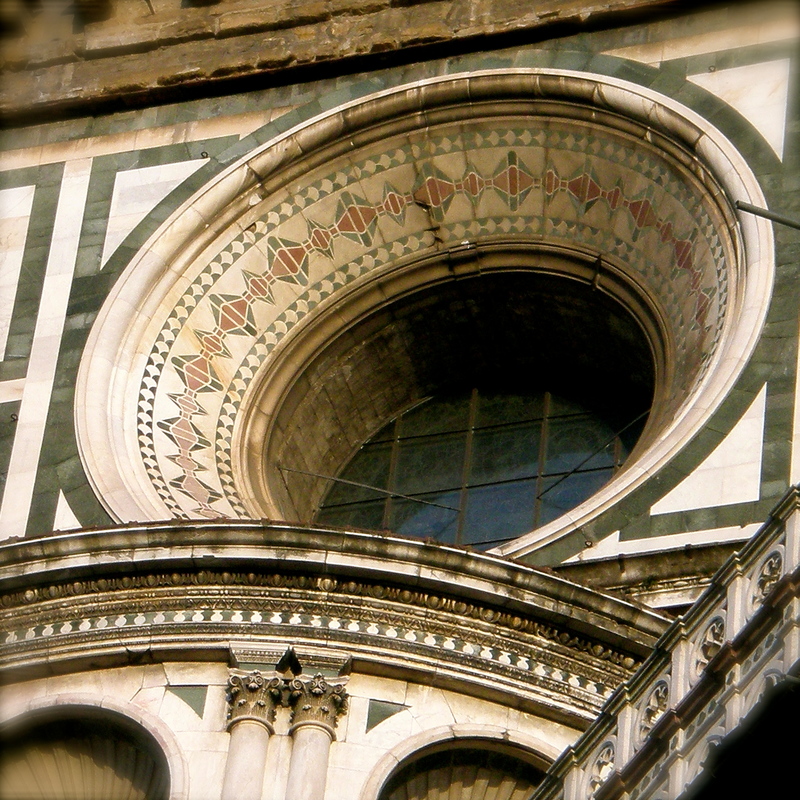 The colors of the Duomo. Perfect size. 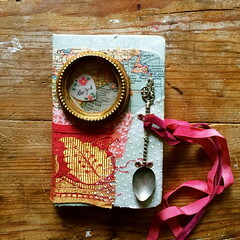 I have found time and again, that when I am in the creative zone working on a project, connected to my artistic flow and some force higher than me, items that are the perfect element for what I am working on just “appear.” It happens over and over. 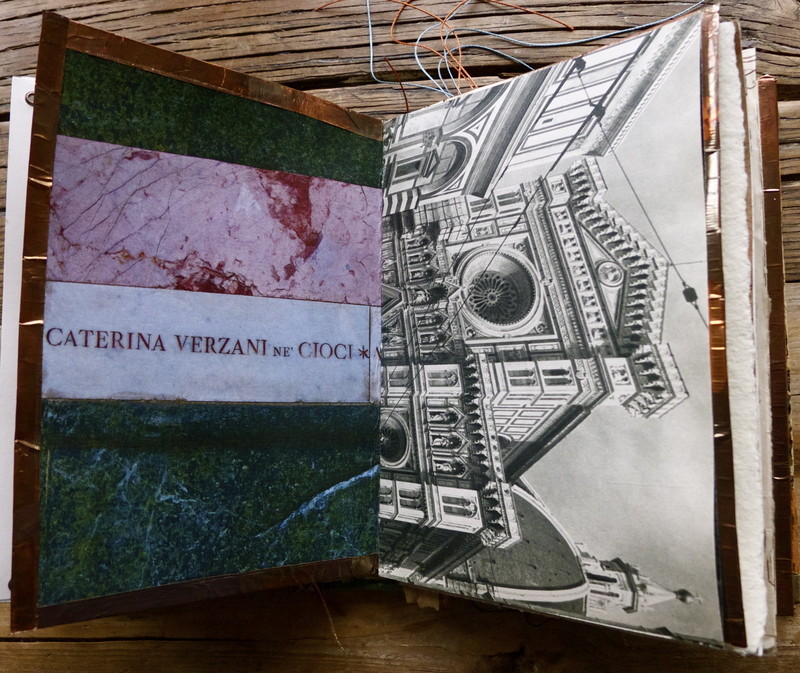 And so it was with these marbled book covers, the colors of the Duomo facade. How likely is THAT? AND a pair, no less. 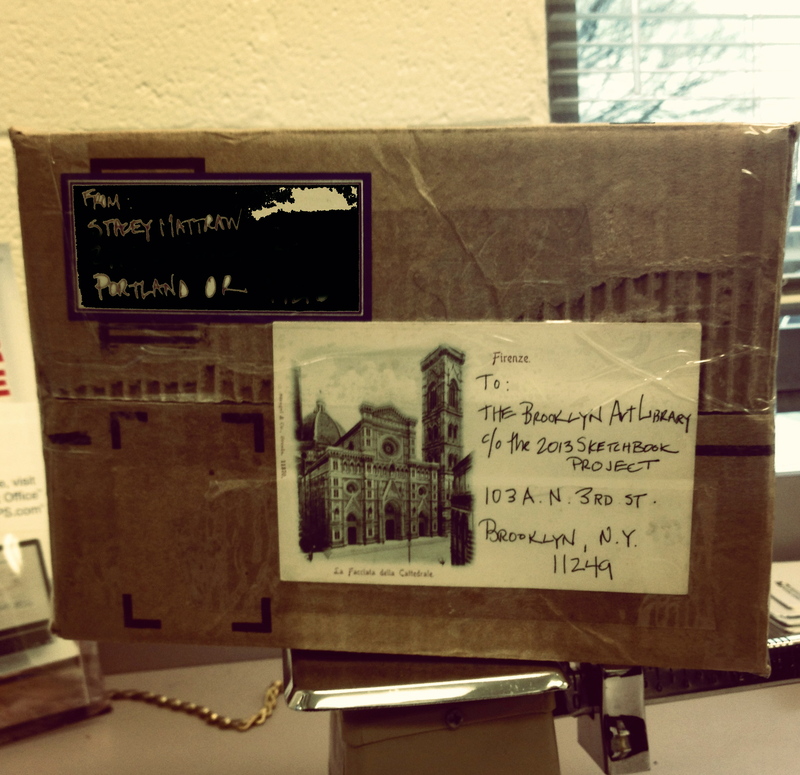 With the Sketchbook Project, once you submit your book to the Art House, and it then lives in the permanent collection at the Brooklyn Art Library. You never get it back. 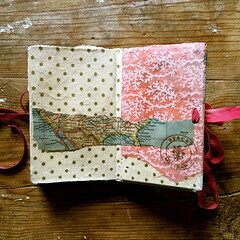 Now I could make two versions, one for the Sketchbook Project, one for me. The deadline this year was January 15, 2013. 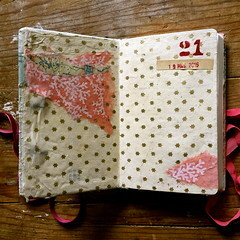 And in my usual procrastinating modus operandi, I did not begin the book until December 30, 2012. Hey, two weeks is plenty of time to pull off this ambitious project right? Not when you get hit with the worst flu/cold one can imagine on January 3, and can barely get out of a bed for a month. I have not been this sick in years. 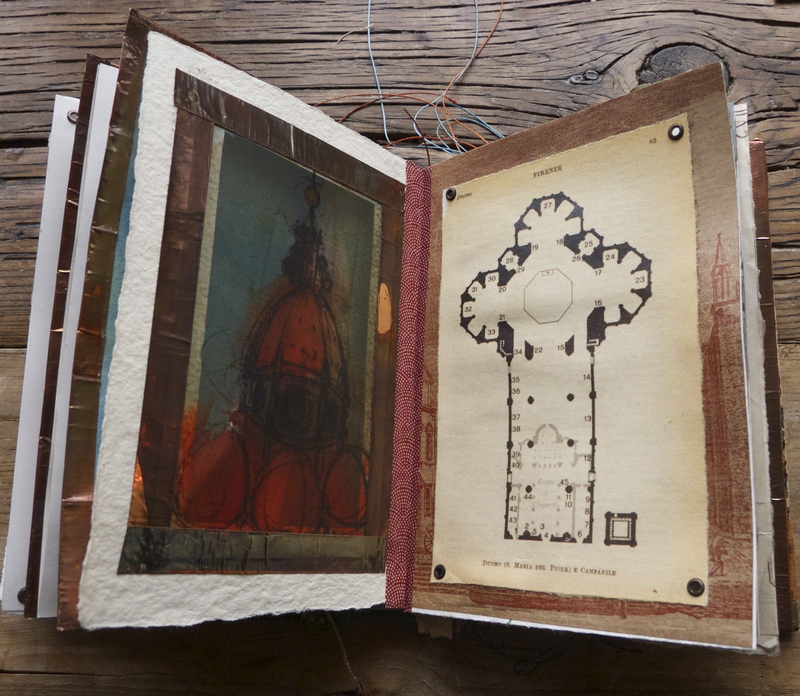 But, I was determined to do make this book, so I pushed myself into art/book making and I pushed hard. It was not a pleasant experience. It was actually kind of horrible, except for the ah-ha moments that I would occasionally have when a page would evolve in a magical way and I would lose myself in the creative zone and process. But most of the time, it just sucked. But I persevered, coughing, sneezing and often with a high fever. And it got done. By the afternoon January 15, the deadline date. And I must say, even though it was not fun AT ALL (and only because I felt so crummy) I am really happy with how it turned out. 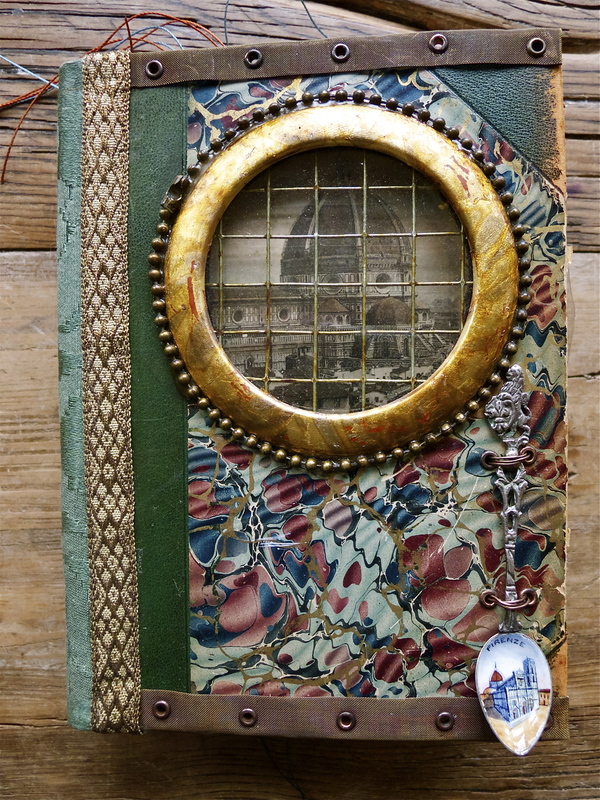 The two covers which I deconstructed and then I inlaid antique frames, mimicking the round windows on the cupola of the Duomo. 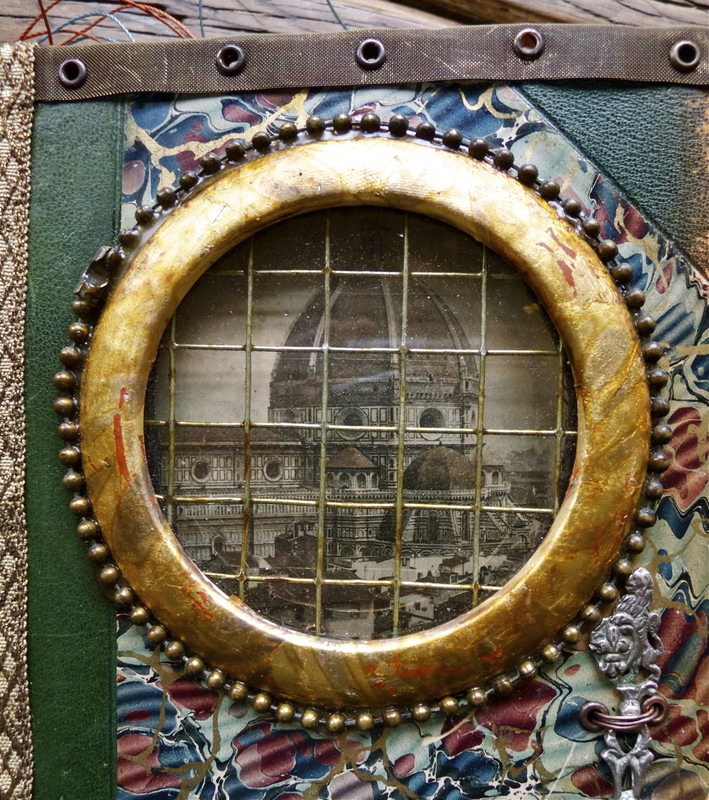 I fixed wire grid hardware cloth on the backside to the “window” to echo the actual metal rebar grid system that holds the real stained glass cupola windows in place. Skating in at the last minute. 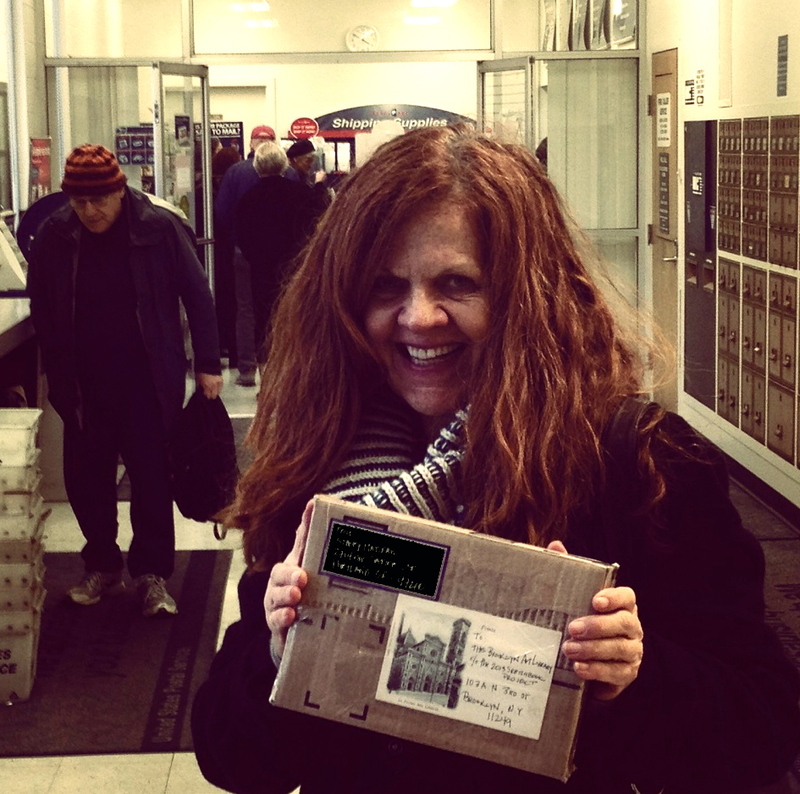 Relieved, happy, sick, but so glad I did it. 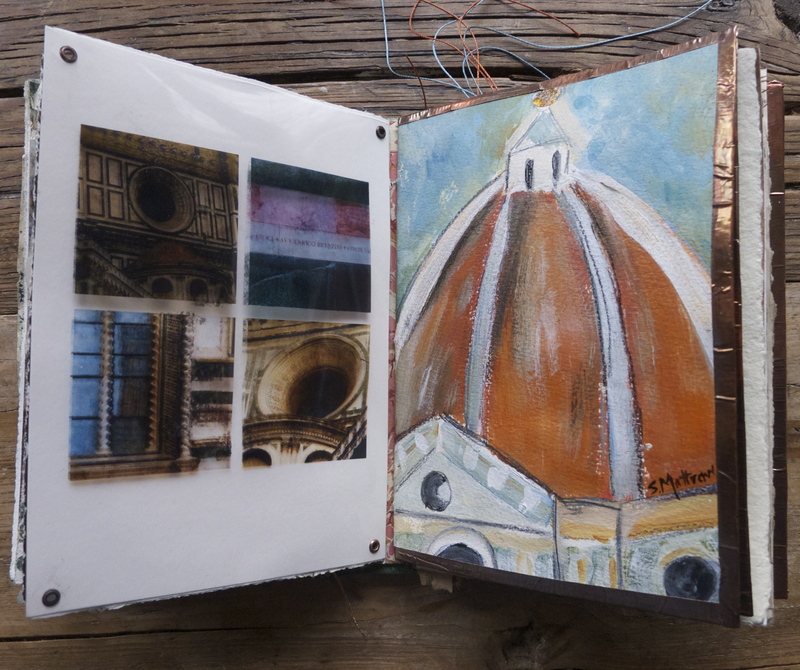 Now, four months later, I have finally started on Version II of the Duomo book. 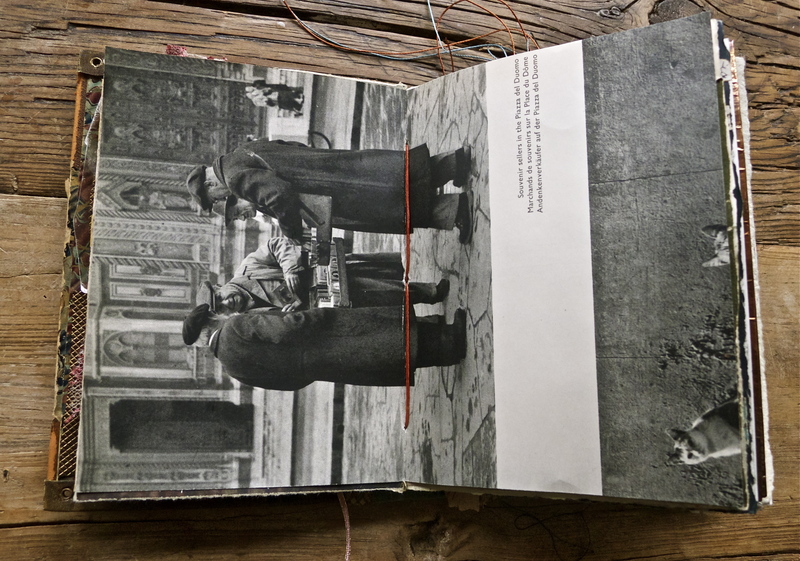 It is similar in construction and cover, but as I have started working on the pages, I am making them different, even though it was my original intention to do a carbon copy of the first version. But what fun is that? I am loving doing this Version II however, I am NOT sick anymore, and I get extremely grumpy when I can’t get to my studio to work on it. Just ask my kids. I should have it done in another week, because, as always, I have a deadline to finish it in the next 2 weeks. More about that later. 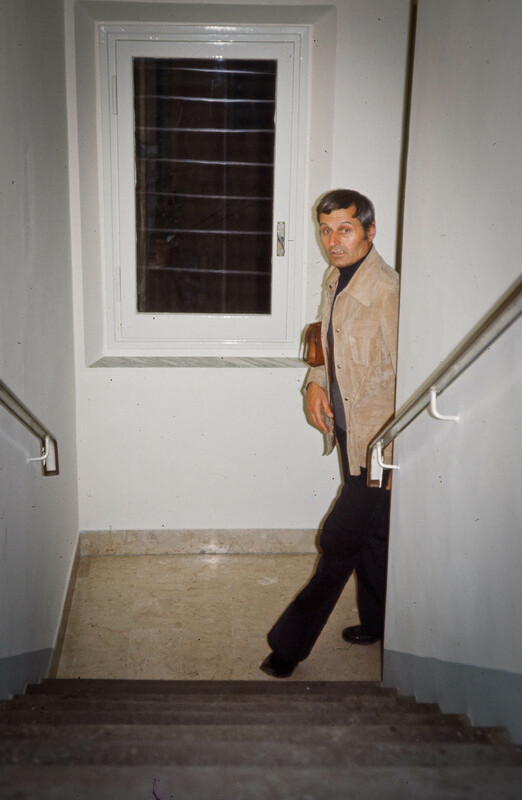 And lastly I want to close this post by acknowledging the person who made so much of this experience in Florence possible in 1976, our beloved Duilio Peruzzi, who was the resident director of our program that year. 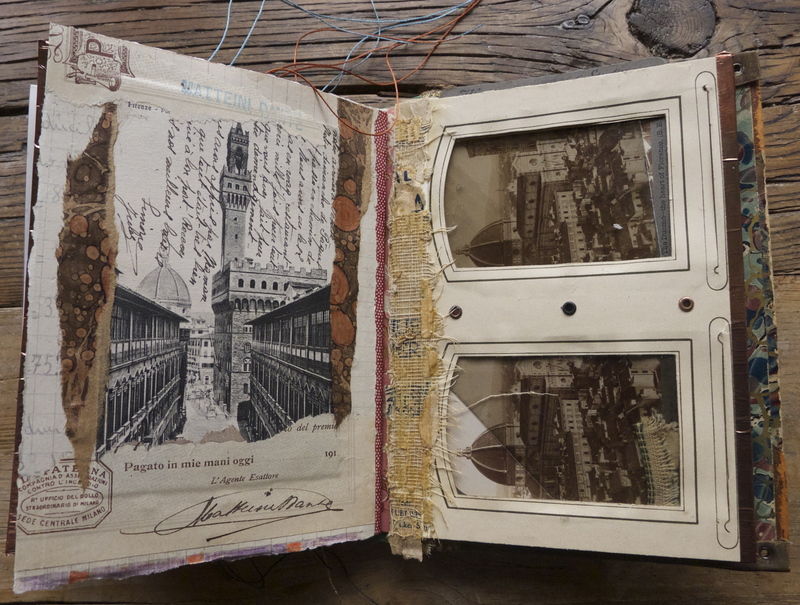 Duilio was born in Cortona, Italy but immigrated to California at some point in his youth and went on to become head of the Geography Department at San Jose State University. 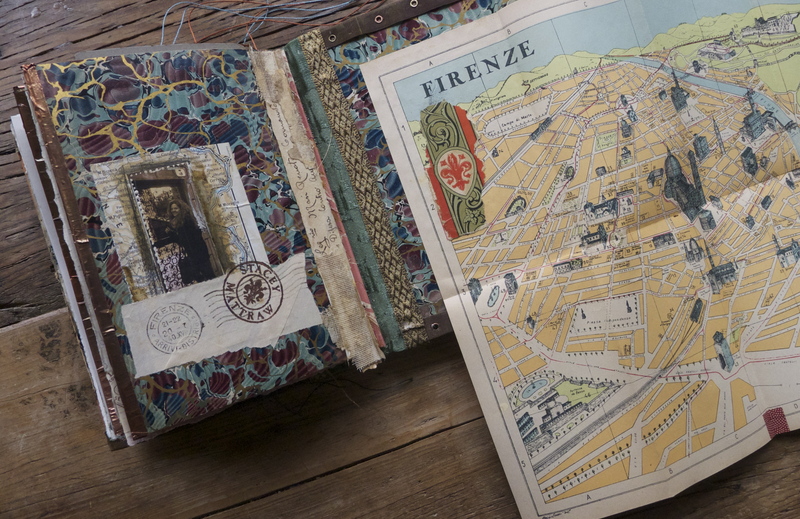 He remained very connected to his family and home town of Cortona, Italy over his life and went back and forth frequently. 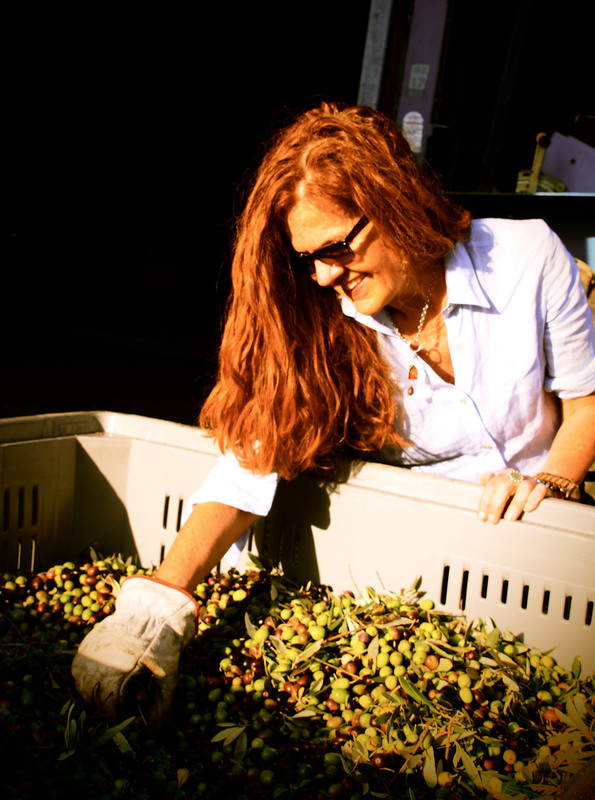 Each year, the California State University system sends a professor from California to be resident director of the Florence program. The gods were smiling on this motley crew of 50 + students in 1976, because Duilio Peruzzi was selected for OUR GROUP, and it was the most memorable, inspiring, incredible year for all of us, and all due to this incredible man. Duilio was and is a mentor, a father figure, a friend, a confidant, our anchor, then and now. He partied with us all though out the year, and although he was THE authority figure, he was also one of us. So today Dr. Peruzzi, celebrates his birthday, on May 2. In a few weeks, most of our group will meet up with him in Santa Cruz to celebrate our everlasting friendship with each other. I wanted to write this blog post on his birthday, in honor of him and the richness he has contributed to all of us. AND I have 21 minutes until midnight, and then it isn’t May 2 or Duilio’s birthday anymore. I had better finish this up. How gorgeous, Stacey!! 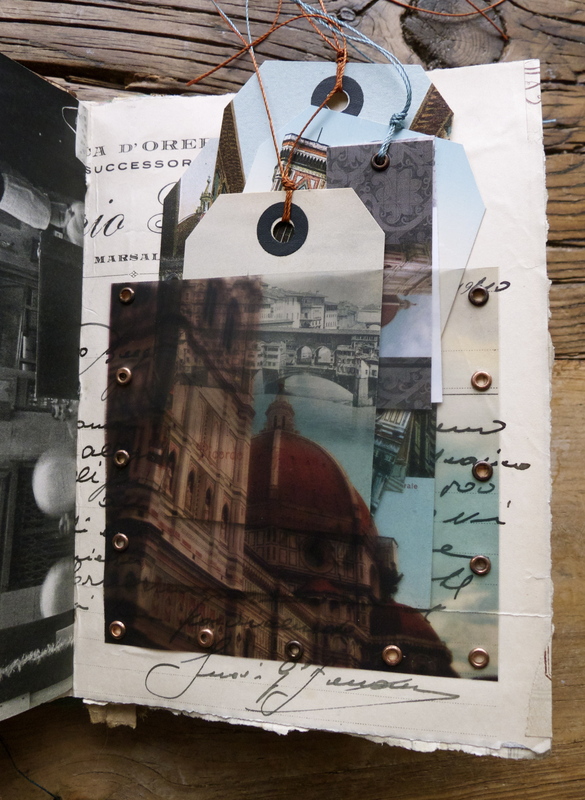 You’ve captured exactly the beauty, joy, and majesty of Il Duomo, and our mutual love and appreciation of Duilio! I’m amazed by the extremely high quality of your work and you! Truly wonderful art by a wonderful person, and a marvelous birthday gift for Dr. D.! Way to go! Brava, Carina! 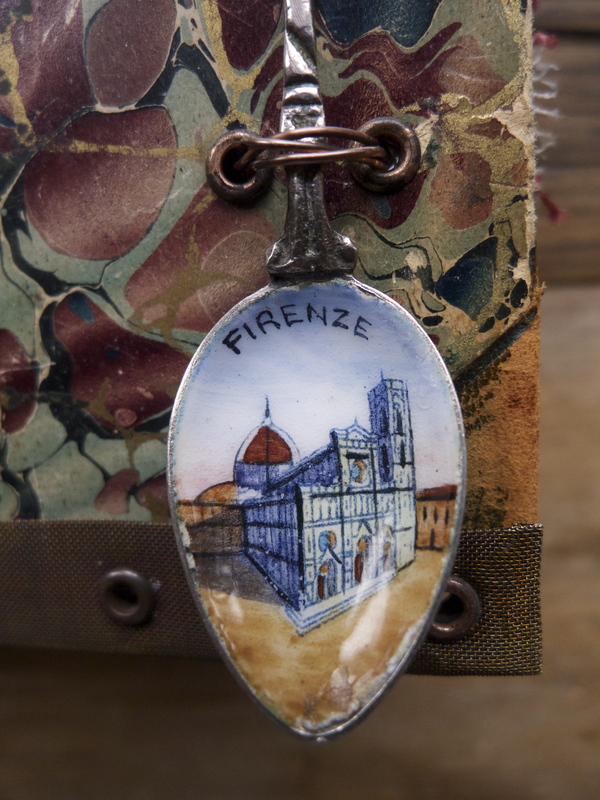 Thank you Stacey for such an amazing tribute to our wonderful magical Firenze and Il Duomo. 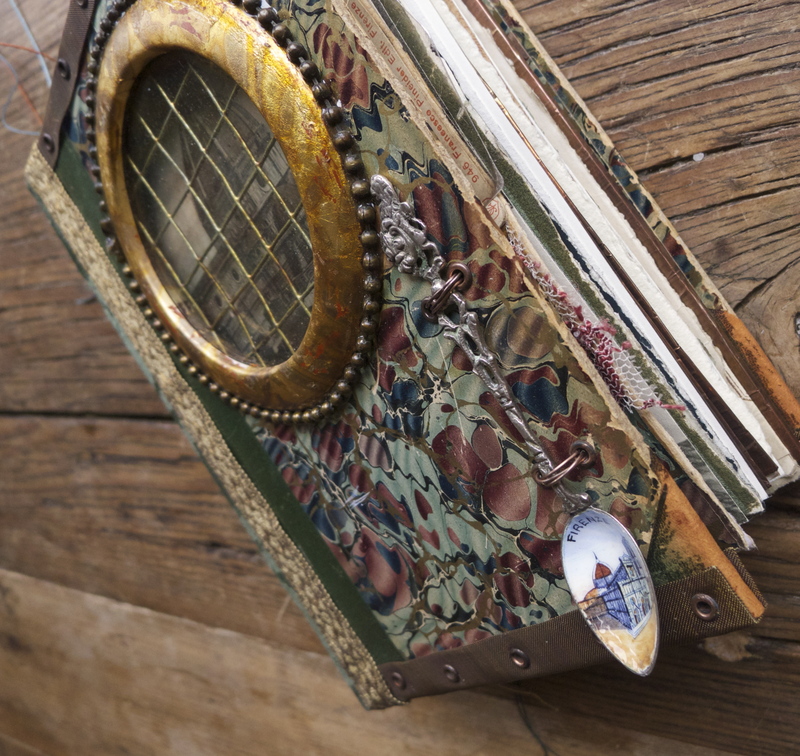 Your thoughts and memories are so beautifully conveyed through your inspired art. You expressed exactly what we all still feel for that spectacular year. Each and every one of us continues to call that year our life defining experience, including our dear friend Dr. Duilio Peruzzi. Bellissima Staci!